Not very many people travel to Bhutan, but when they do, fabulous stories of this isolated and exotic destination emerge. From forests to monasteries and everything in between, read what these four travelers experienced on the Fall Festivals of Bhutan trip, one of the Bhutan travel packages we offer at Journeys. We have just returned from a wonderful trip to Bhutan: Druk Yul: the land of the thunder dragon, the most isolated and exotic land in the Himalayas. Roughly the size of Switzerland, it is almost entirely mountainous, ranging in altitudes from as low as 350 feet to as high as 24,000 feet. This helps to explain Bhutan's long-term isolation from the rest of the world until the 1960's. About 70 percent of Bhutan's 18,000 square miles is forested, and the nation treats nature with admirable respect. The king is young and environmentally sensitive, and many of the country's higher regions remain nearly free of the footprints of man, untouched examples of the fast-disappearing Himalayan environment. Bhutan is a very Buddhist country, so it is no surprise to see monasteries everywhere you go throughout the country. They are mostly perched way up high on the mountaintops and hidden deep in the river valleys. It is the intent of the location to give the monks peace and solitude so they may meditate their lives away in trying to achieve the final Nirvana. The most revered and also the most famous monastery—and most famous piece of architecture in the country—is the Taktsang, or Tiger's Nest. It is the destination of all reverent Buddhist pilgrims in Bhutan at some time in their lives. Located about 3,000 feet above Paro Valley in western Bhutan at an elevation of 10,200, it was founded in 747 AD by Guru Rinpoche (previous teacher), the second Buddha. Legend has it that he landed on this spot from neighboring Tibet astride a flying tiger, bringing the tenants of Buddhism with him. The monastery almost defies gravity as it seems to literally hang on the edge of a sheer drop of over 3,000 feet belo w. Needless to say, it was a bit scary once we got into the structure and looked out and down. The location is startling, with nothing breaking the silence except a waterfall, the call of a raven, the fluttering of prayer flags, and the chanting of a few monks. We started our hike up at the trailhead about 7,500 feet and went up a trail of about 2 miles to the site at 10,200 ft. We were told it would take about 3 hours; we did it in 2.25 hours, but were very winded along the way, as it was only our second day in Bhutan and we had hardly acclimated to the altitude. It was certainly the hardest hike we have ever undertaken. Even in Bolivia and Peru, on hikes over 4,000 feet higher, the trails were never as steep as this. But the end result and views were worth every step. Unfortunately, you are not allowed cameras inside the monastery which would have made for some spectacular shots out across the Paro Valley. One of the reasons for planning trips to Bhutan in the fall is to experience their traditional festivals, called "tshechus." These take place in the great dzongs—the fortified monasteries that remain the centers of religion, education and local government in each district of the kingdom. They are not staged for the benefit of visitors, who consider themselves privileged to witness these events, which have remained unchanged for centuries. Interested in travel to Bhutan? Let us know and we'll call or email you to answer all of your questions. Rick and Paula Vogel and Larry and Judith Miller met on a Journeys trip and soon realized what great travel companions they were. So, they signed up for more trips together. 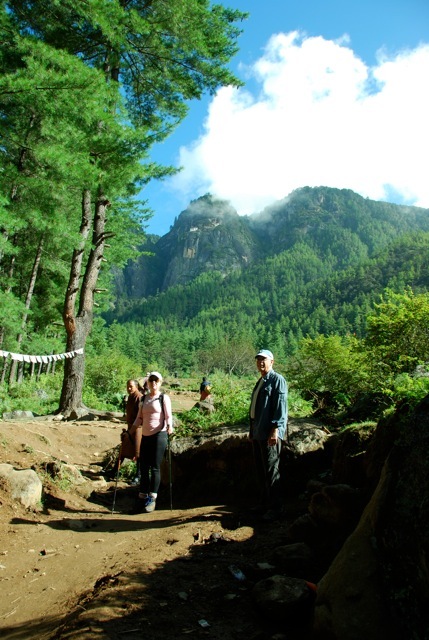 This particular trip was a customized and private departure of Fall Festivals of Bhutan. Many thanks to the Vogels for sharing their stories for this blog post.